The innovative Bluespot ® blue forklift light helps avoid forklift/pedestrian collisions. In the USA alone, there are 19,000 forklift/pedestrian accidents each year. Sure backup alarms are effective, but what happens when employees are listening to music, talking on cell phones, or staring at the ground? That's where the Bluespot ® blue light for forklifts can help! Install the blue light on the rear portion of the forklift's overhead guard. A focused beam of blue light will appear on the ground behind the forklift. Intella sells more Bluespot ® safety lights than ANYONE in the USA! Don't buy a blue forklift light from any other online source until you research our light and understand what makes ours better than any other version out there. 01291296 is UL listed. This is the ONLY UL listed blue safety light on the market today. Beware of imitators! Replace your existing forklift forks with EFORKS scale forks! Avoid forklift/pedestrian accidents with the Blue Zone/ SIS Easy system. System detects pedestrians and warns forklift operator of objects behind forklift. 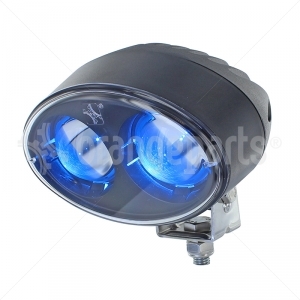 Click here to learn how the Blue Safety light helps avoid pedestrian/forklift accidents! NOW in stock: NEW UL listed version! Now in stock: blue spot sign to inform and alert! Check out our newest addition to our seat program! There's never been a better reason to switch your forklifts to LED lamps! Read about us in Material Handling Wholesaler magazine! Rectifiers, diodes, SEM controllers (new and rebuilt), contact tip kits....NOW IN STOCK! Intella Liftparts now offers forks. We're centrally located in Michigan for quick shipping throughout the midwest. © 2018 Intella Liftparts INC. Call us 616-796-1288 | All rights reserved.